Track your workout from the top of a mountain, or in the middle of the lake. Anywhere is possible with the Steel HR. Easily keep track of any activity you do with Steel HR’s automatic recognition of walking, running, swimming and sleeping. Track your heart rate during workouts to optimize training, and monitor daily and resting heart rate to improve your health over time. 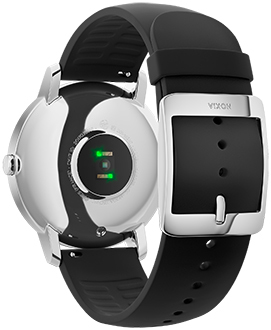 See how far your Steel HR can take you with a battery life of up to 25 days, plus 20 more on reserve power mode. With water resistance up to 50m (5ATM) you can shower, do dishes, and go swimming all while wearing your Steel HR. Receive notifications for texts, emails, calls, and events on the discreet digital screen embedded in the analog watch face. The Steel HR automatically synchronizes with the Health Mate app, where you can view trends, gain insights, and unlock rewards. From sleep tracking and heart rate monitoring, to goal setting and step-by-step programs, the Nokia Health Mate app records your progress and helps you achieve your goals. 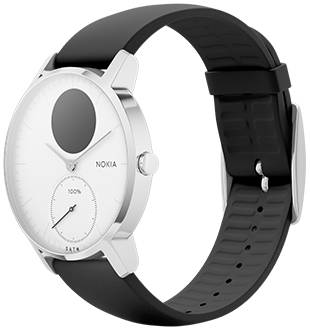 Go to the Bluetooth settings on your device and pair your Nokia Steel HR with your device. 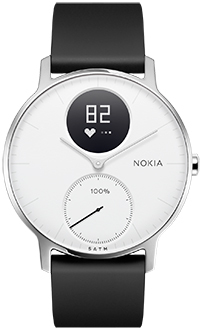 Install the Nokia Health Mate App to easily track all of your health data in one place.